Eighteenth century English essayist Charles Lamb presciently proclaimed, “Nothing puzzles me more than time and space; and yet nothing troubles me less, as I never think about them.” Substitute water for time and space, and you have the conundrum of Cynthia Barnett’s quest to create a water ethic. The somber, sobering message of her Blue Revolution is that when it comes to water, most people don’t know what they don’t know, presuming that water is an abundant, always available resource, and therefore never think about it. But of those who do think about water, too many do not embrace the water ethic and consequently are scheming, self-promoting, self-indulgent, and/or irresponsible. Simultaneously a necessity required by all yet very expensive, water is both the essence of life and the symbol of luxury. Water is presumed to be a free good, partly because it is so evidently visible in rivers, lakes, and oceans. And when water is priced, the costs charged are far too low, so inappropriately so that the nominal payment encourages undisciplined, wasteful, even destructive use. Water is the smallest household expense check. Pricing is inconsistent if not irrational, and incentives are perverse: thrift is not rewarded and waste is not penalized. Water use varies dramatically, ranging from 33 and 42 gallons per day per capita in Holland and London, respectively, to nearly ten times as much in Sacramento: 300 gallons per person. Water is not prioritized in the public policy dialogues re the environment and sustainability. Notably, of 69 point categories for the LEED environmental building standards assessment, only five pertain to water use. It is not so surprising, then, that some naively, wrongheadedly assert that water should be “part of the commons,” available for free, to be used as much as anyone might want, without cost or responsibility, irrespective of consequences for depleting aquifers, the term for the below ground reserves of water, whose continuing are crucial to sustainability. This “place resource as a discardable, easily replaced commodity” mentality is the antithesis of the water ethic that Ms. Barnett advocates. Ms. Barnett aspires by her writing to “unmake America’s water crisis” by raising awareness of a problem that many do not recognize, bother to think about, let alone to address. 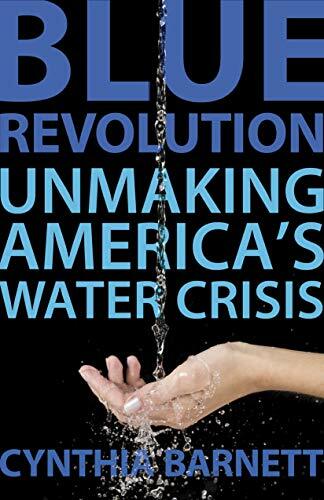 The author believes that a precondition for achieving the goal expressed in her book’s subtitle—Unmaking America’s Water Crisis—is for all people to have an informed, positive, up close and personal relationship with water. Blue Revolution is told through stories of people, their water challenges and strategies, and, more importantly, places, both a cross section of the United States and distinctive places in Asia, Europe, and Australia. Places whose good, bad, and ugly water stories Ms. Barnett tells include Atlanta, Florida, Holland, Las Vegas, Milwaukee, Perth (Australia), Sacramento, San Antonio, and Singapore. For all this book’s virtues—indeed it has many, for most readers will gain insight and awareness of a critical issue that they did not sufficiently recognize, let alone understand—Blue Revolution is not without opportunity for enhancement in a subsequent edition. The needed articulation of what the water ethic embraces is not as explicitly crisp as it might be. The particulars of a campaign for achieving the “unmaking of the water crisis” are not prescribed. In common with many books on big, complex subjects by journalists lacking the strategy, economics analysis, and systems tools to integrate the totality of the subject, an overarching framework is not advanced. • Recovering, preserving, and protecting wetlands, watersheds, flood plains, and aquifers. • Balancing the public interest with private property interests. The water ethic involves the many stakeholders working collaboratively rather than adversarially—with nature and competing interests: power generation, agriculture, landscaping, building operations, drinking water, and recreation—to develop priorities and design strategies, through holistic, systems-based thinking, deciding, and acting. Blue Revolution is a clarion call for thought leaders and thoughtful people alike to embrace the equivalent of Aldo Leopold’s land ethic: a way of relating to ecology, which he championed in his life and in his A Sand Country Almanac. Water will be ever more critical in the future, not only because there is less of it as a result of irresponsible and inefficient use, but also because there are more people needing water. And with a growing share of society living in urban areas, their continued access to water requires more careful calculation and systems applications—at the very time that growing numbers of people are less aware of water issues generally and the centrality of water in the larger context. Stephen E. Roulac, Ph.D., is a leading authority on the economic productivity and strategic importance of the places in which we live and work. A respected cultural visionary, combining entrepreneurial pursuits with scholarly research, and author of some 20 favorably reviewed books, he has received numerous awards for his research, publications and body of work. His work is informed by insights derived from primary advisory roles to major decision-makers in all facets of business, government, real estate, and investing in 20+ countries over four decades.